The latest development in NYC’s seemingly unending dumpling craze comes to you straight from the garbage. 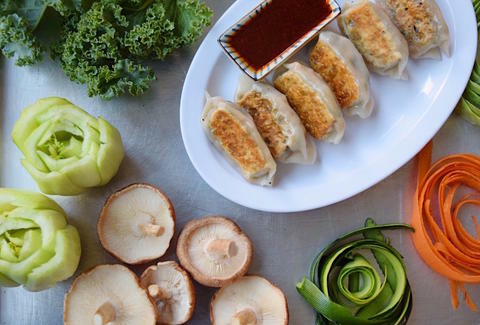 In an effort to raise awareness to combat food waste, dumpling haven Mimi Cheng’s has released a limited-edition dumpling that will be made out of vegetable scraps like zucchini ends and kale stems. The offbeat dumpling is the result of a collaboration with sustainable chef Dan Barber, who in March 2015 turned his restaurant Blue Hill into WastED, a pop-up featuring high-end dishes containing only food scraps. Selling out nightly for a month straight, the pop-up sought to raise awareness about food waste and make a case for the use of oft-discarded ingredients. Continuing Barber’s mission to make scrap food desirable, the dumplings look just like the regular veggie dumplings on Mimi Cheng’s menu, rather than something plucked out of the trash. The food scraps are held together by peanut-ginger sauce and bound by the shop’s thin wrappers. They’ll be available at Mimi Cheng’s East Village and Nolita locations for the entire month of February and cost $8.75 for six and $10.75 for eight, which is definitely more than you’d pay for your own food trash. Ciera Velarde is an editorial production assistant at Thrillist who now feels really guilty for throwing away her apple core yesterday. Follow her on Instagram.